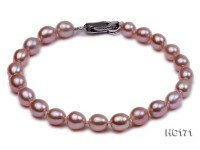 Exquisite 8-9mm white pink and lavender frashwater pearl bracelet. 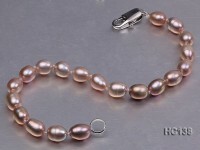 This necklace is made of good quality 8-9mm flat pearls. 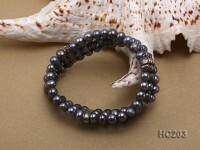 The bracelet features lustrous, smooth and similar-sized pearls with slight blemishes. 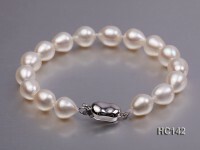 And it is professionally hand-knotted between each two pearls, which makes them look nicer and protects the pearls from rubbing each other. The bracelet has a length of 7.5 inches and it is closed by a gilt clasp and decorated with zirconia accessories. Very good quality and very good price. It will give you every satisfaction.